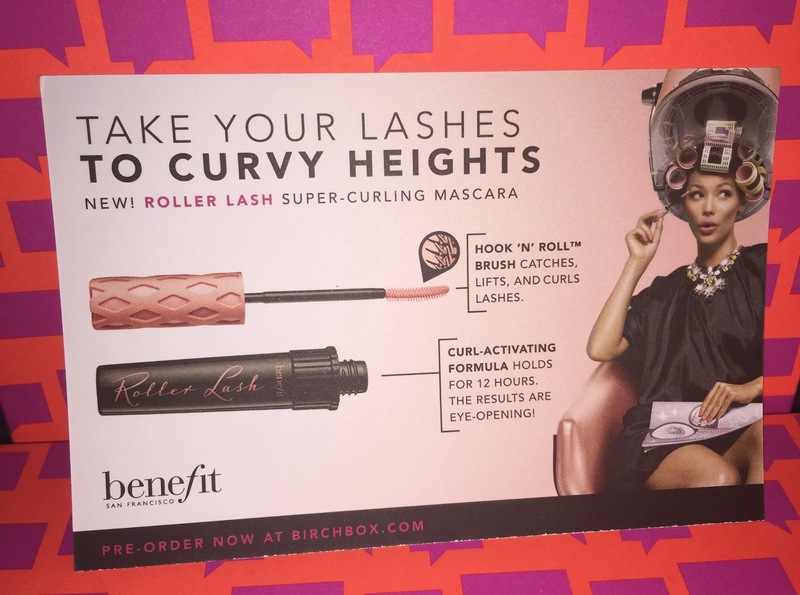 i haven't been buying lots of makeup because I've been on a mission to use up a lot of my stash, but last week I placed an order from Sephora for a new hair product and I had a code to try a free deluxe sample of the brand new Roller Lash mascara from Benefit Cosmetics. 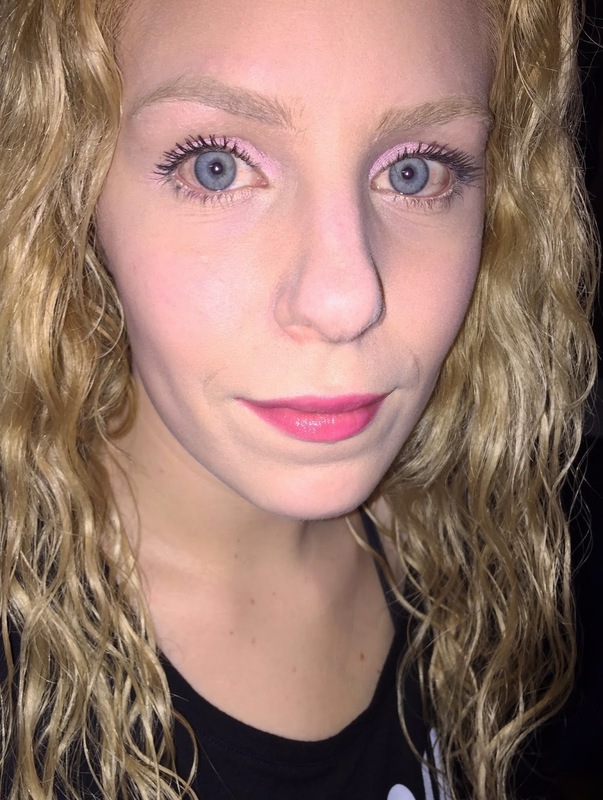 I think the code was "RollerLash" I love mascara and Benefit Cosmetics is one of my favorite makeup brands so I had to give it a try. I am so happy I tried this sample because this mascara is INCREDIBLE!!!!!!! I was already a fan of the They're Real mascara from Benefit but wasn't wild about the brush and I never cared for Benefit's other mascara, Bad Gal Lash. 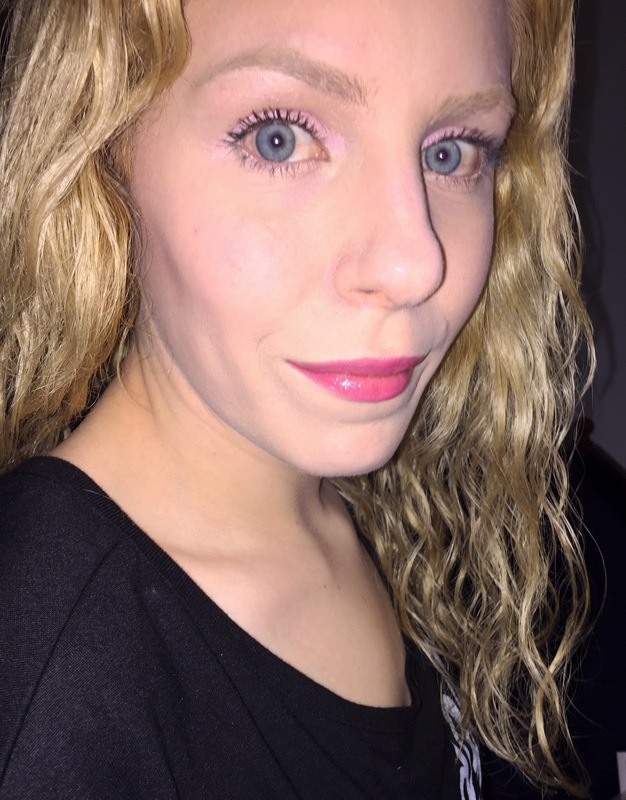 I actually like Roller Lash better than They're Real! I'm pretty sure my before and after pictures using this mascara below speak for themselves. I did not curl my lashes and I am not wearing eyeliner either! I don't even have on the eyelash primer I sometimes wear under mascaras when I really want extra "ooomph" because I don't need it! 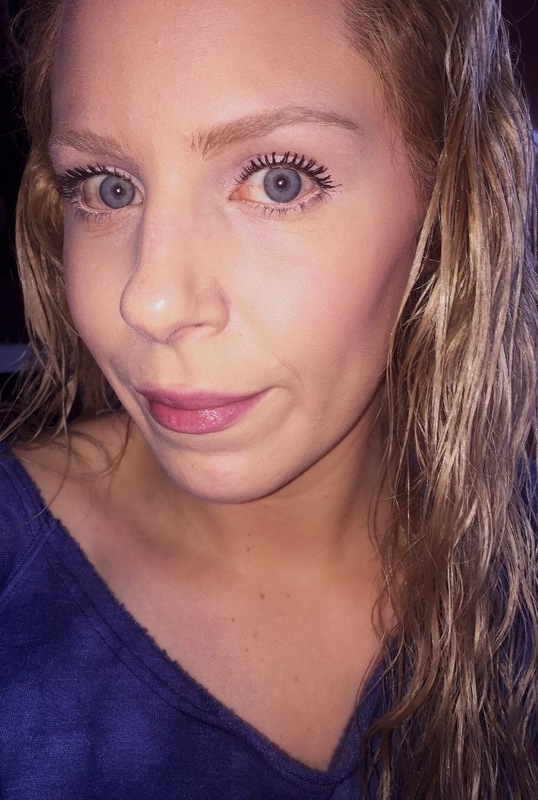 As someone who has super short, blonde, straight lashes- mascara is mandatory and I am picky. I also have very sensitive eyes and some formulas make my eyes tear or burn. I don't think I've ever used a mascara before that gave me the lift and curl this one does. 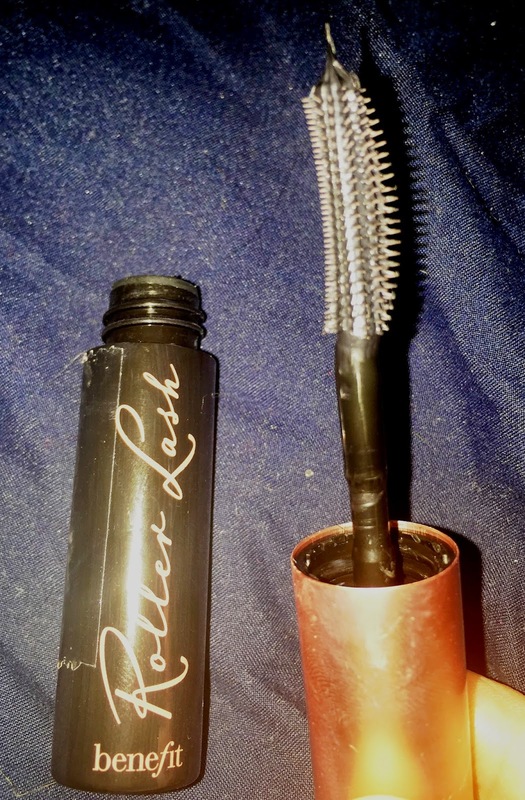 It lengthens my lashes too and with multiple coats it also thickens them. If you want a less intense look you can use less coats of the mascara. The brush is great because the little hooks get every last lash and help make application clump free. The mascara wears all day without flaking or smudging and easily is removed with my makeup remover at night. 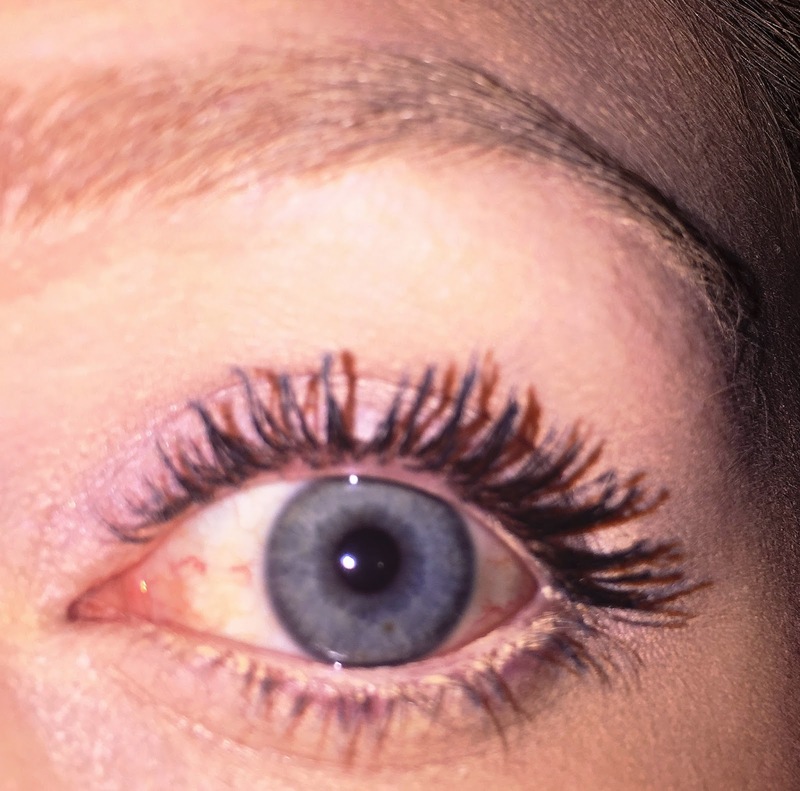 It doesn't irritate my eyes whatsoever and has incredible dark black pigment. I can't think of one negative thing to say about this product it is just sooo good! disclaimer: product was a free chosen deluxe sample with a purchase from Sephora. I receive no compensation for my review and all opinions and my own truthful thoughts. 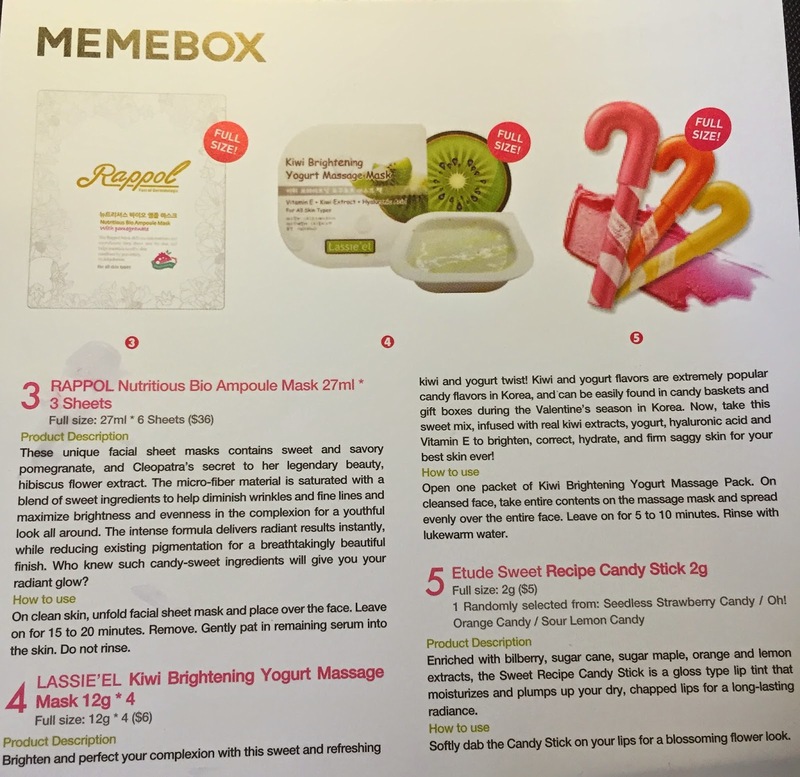 Memebox is fun beauty subscription box. What's nice about this is it is not a re-occurring subscription box, and you only buy the boxes you may be interested in. Sometimes they tell you what it in the box and sometimes it is all a mystery. 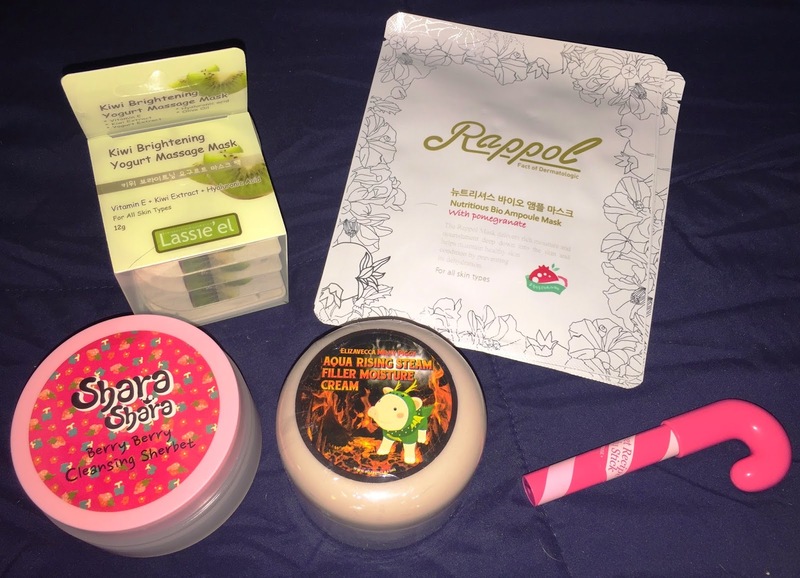 The Memebox focuses on popular Korean beauty products. I received one box prior to this a few months ago and enjoyed the products so this is my second box. 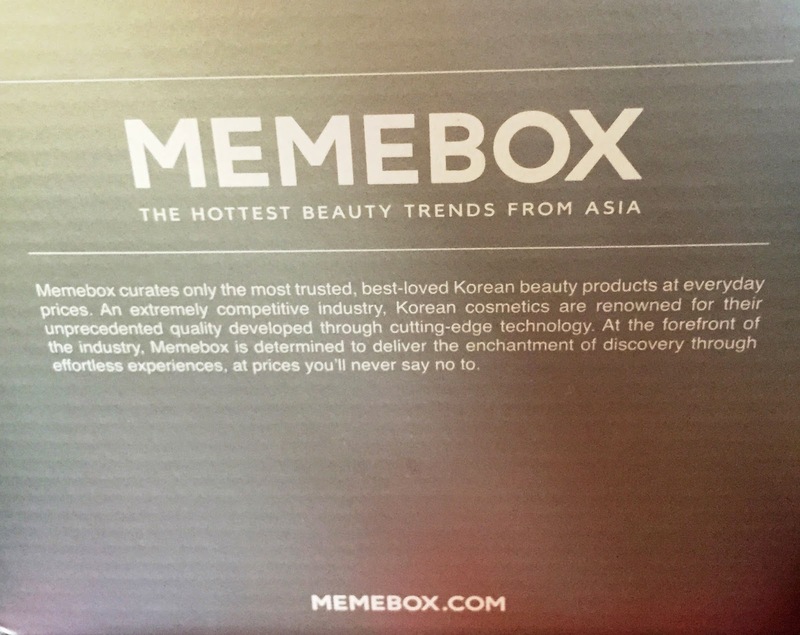 Memebox is the fastest trending beauty company in the world. We offer the latest Korean beauty products in exclusive curated boxes and collaborate with rising digital stars to create the latest looks with our own makeup line, XO Memebox. 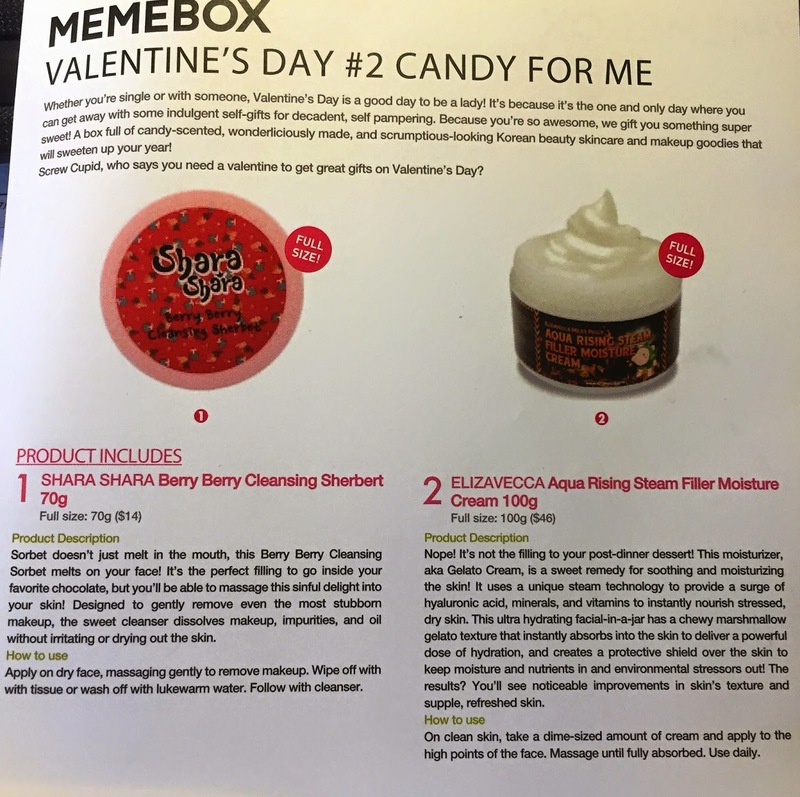 The Valentine's Day #2 Candy for Me box caught my eye around the beginning of February because it was a box full of candy scented products!! Having a big sweet tooth I knew I had to indulge. I do wish there were chocolate scented products in the box. Some items I love and some I will be passing on, as they aren't for me. I paid about $32.00 for the box. 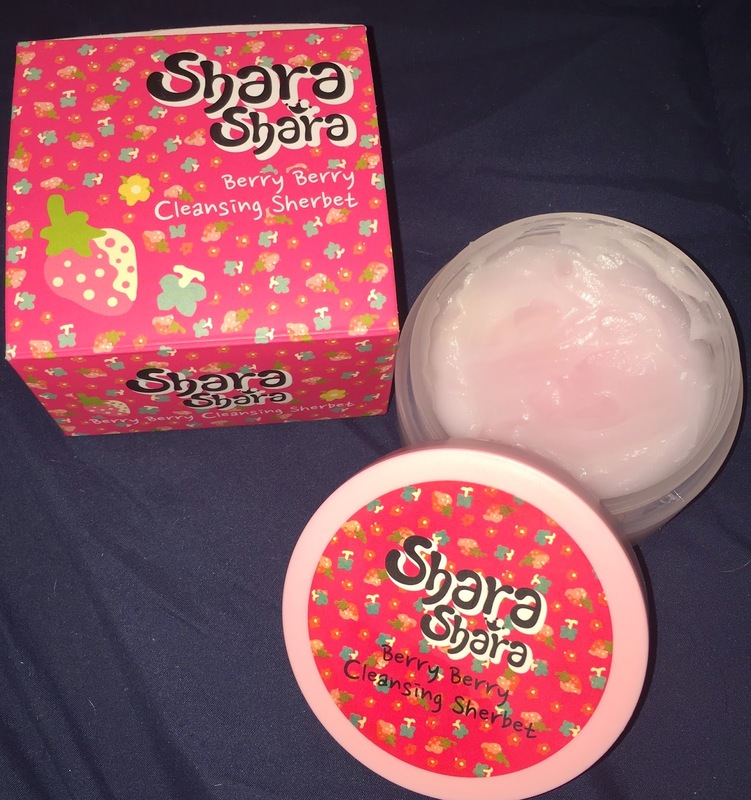 Shara Shara Berry Berry Cleansing Sherbet. The card describes this as a moisturizer much like "Gelato Cream" and it is supposed to smooth and moisturize the skin. It contains hyaluronic acid, minerals and vitamins to instantly nourish stressed, dry skin and supposedly gives noticeable improvements in skin's texture and suppleness. I can't give a review of this product aside from the fact I opened it just to smell it and has no smell at all. I love the little cute cartoon piggy on the packaging but he is part of the reason I haven't used this. I know a lot of Asian beauty brands actually use real pig collagen in some of their products- supposedly it has great skin benefits. Because the ingredients are in Asian characters and I don't understand it on the package, I can't use it. Side note: When I was little, my friend had an adorable pet pig. Because of this I don't like eating pig products and the idea of using a product that potentially has pig in it- I just can't do it. 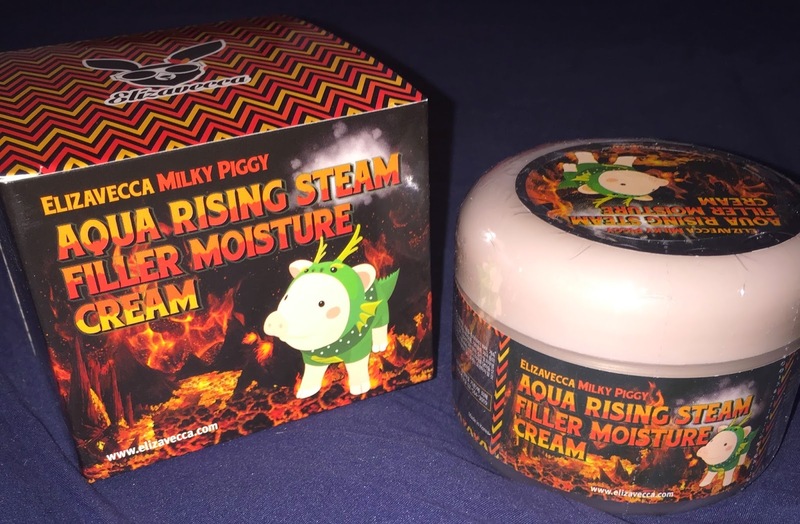 Unless someone can confirm there are no little piggies in this moisturizer, this will be passed on to someone who will use it. I love that this box contained two different kinds of masks as I am a face mask junkie!!!! 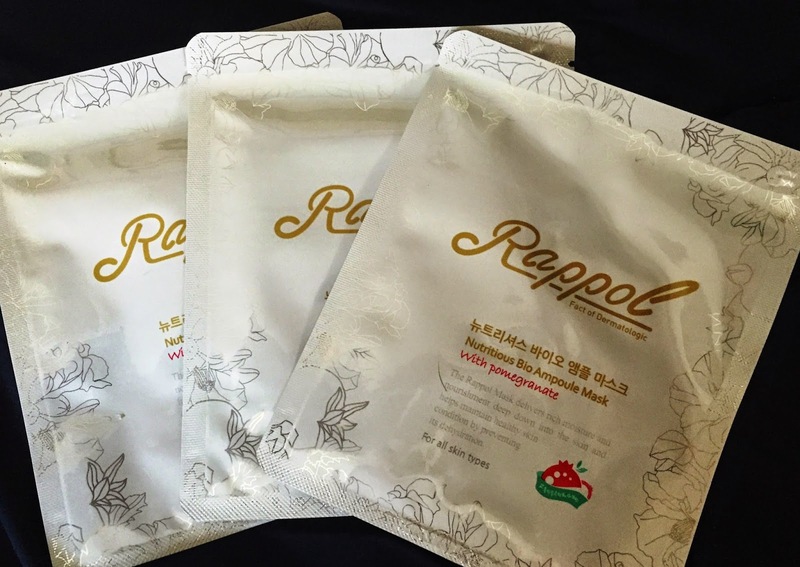 These sheet masks contain sweet and savory pomegrante and hibiscus flower extract. They help diminish fine lines and wrinkles and maximize brightness and evenness in the complexion for a youthful look all around. These sheet masks have a clean, fresh smell to them- I kind of was hoping they'd smell more fruity but that's okay. I used one so far, I should have taken a picture of it on my face. 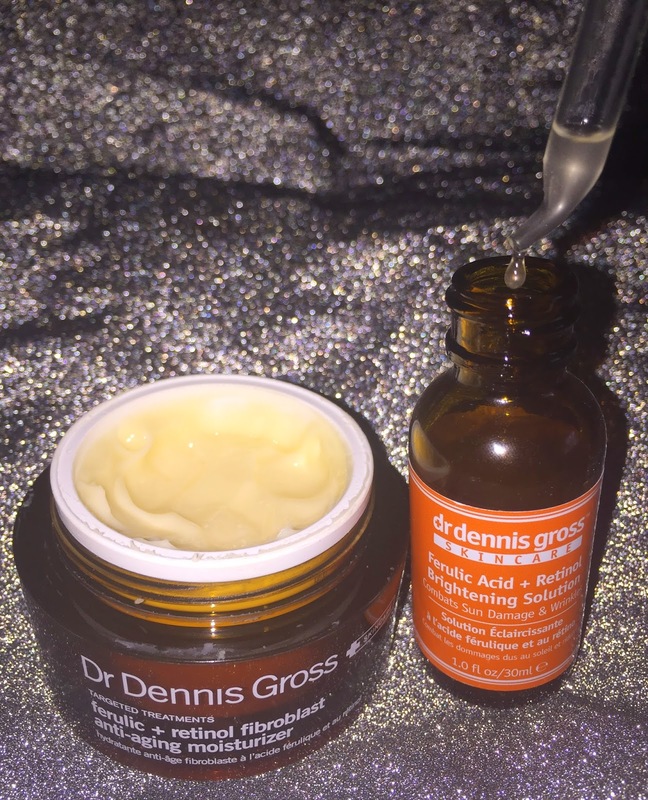 It left my skin with such a beautiful glow and my face felt extremely soft. Nice added hyrdration with this super dry, cold, Winter weather we have been getting lately. I didn't notice a big difference in fine lines or wrinkles, but I imagine that comes with continued use. This mask brightens and perfects your complexion with a sweet and refreshing kiwi and yogurt twist. Kiwi and yogurt are two very popular candy flavors in Korea. Also containing hyaluronic acid and Vitamin E it will brighten, correct, hydrate and firm saggy skin. I used one of these so far as well. 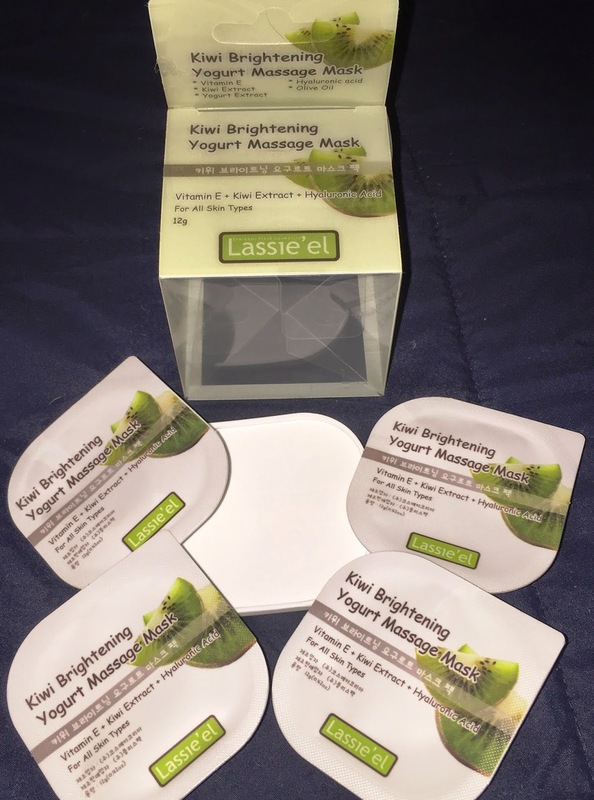 The smell was similar to me of the above mask, and it has a thin yogurt consistency. Like the other mask, it also left my skin looking bright and feeling soft. I do have combination skin and think this would be even better for dry skin types. I was so excited to get something from Etude after constantly reading about this brand on my friend Isabella's blog!!! This is my other favorite product in the kit. There was a randomly selection between Seedless Strawberry Candy, Oh! Orange Candy and Sour Lemon Candy. 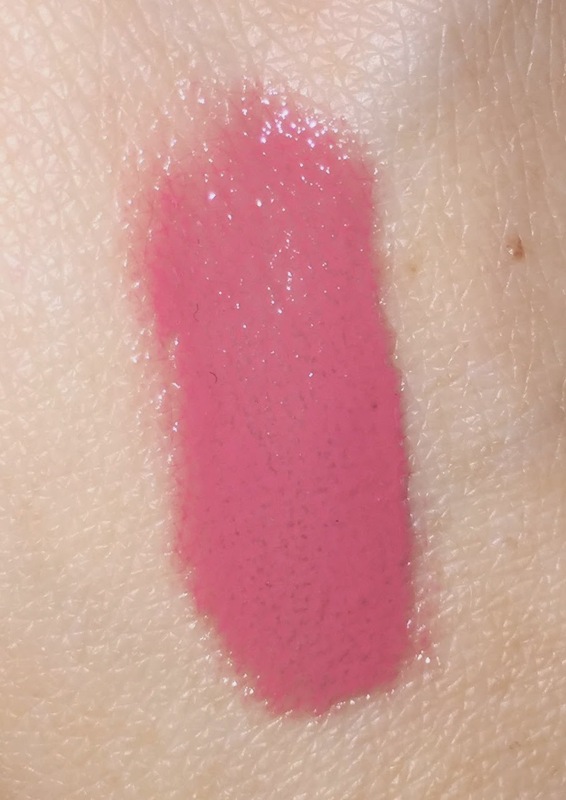 I am soo excited I got the strawberry because it is such a gorgeous shade of bright, juicy pink- my favorite!!!!! This gloss/tint hybrid contains bilberry, sugar cane, sugar maple, orange and lemon extracts to moisturize and plump up dry, chapped lips. 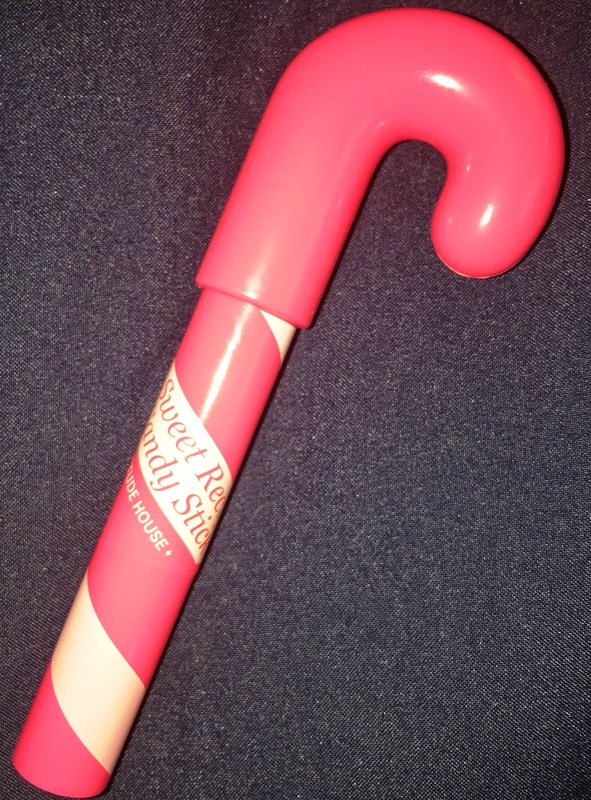 I love the juicy pink color as previously mentioned and the candy cane packaging is adorable. The color lasts on my lips for quite a while, even while drinking from a water bottle. It has a nice amount of shine and leaves my lips feeling so smooth. 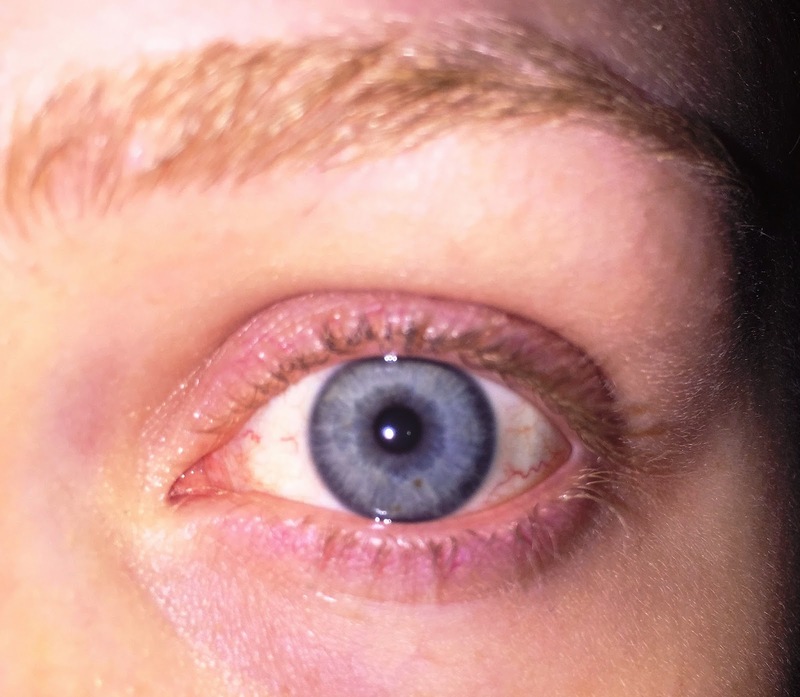 Left: No Flash. Right: Flash. disclaimer: products purchased with my own money. i receive no compensation for my reviews and all opinions are my own, honest thoughts. 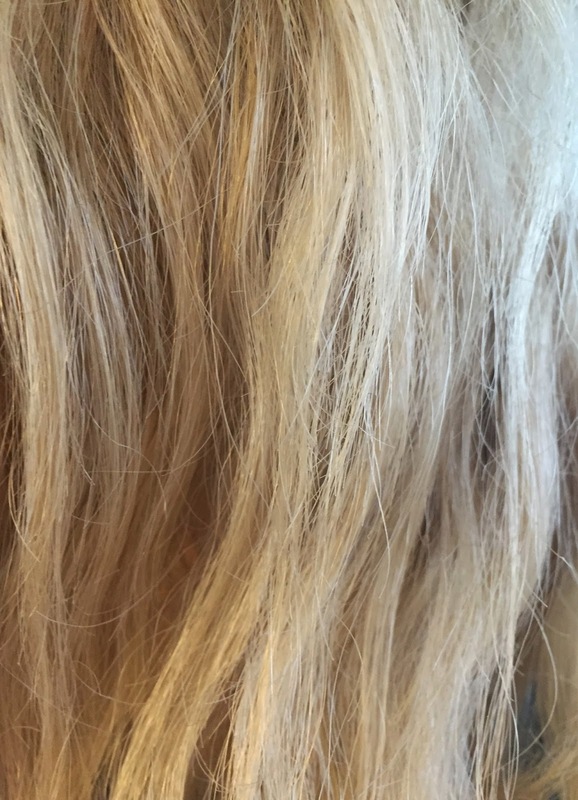 Oh Olaplex, where were you in 2013 when I decided to lighten my hair to almost platinum? 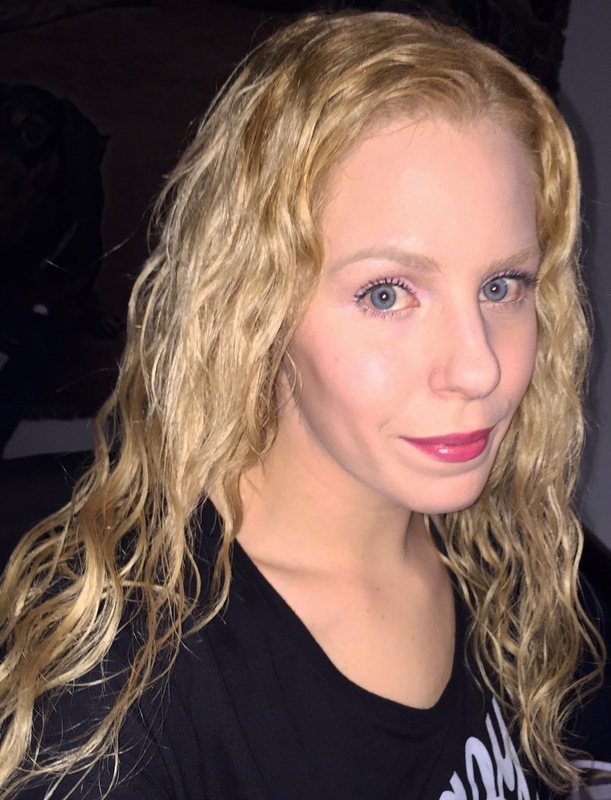 I LOVED the color, but because of bad breakage happening, despite doing EVERYTHING in my power to keep my hair healthy, I had to go a little darker blonde. But Olaplex is here now, it is helping to repair my hair again and now thanks to this miracle ingredient, I have high hopes of going blonder again in the future. Olaplex is bringing my hair back to health in the best way. So truthfully, I have been having terrible hair days lately. It started a few months ago I experiences breakage that I now seem to have under control. Thank God. But I am on the road to recovery and just have to (im)patiently wait for the broken parts to grow out.If you follow me on instagram I'm sure you notice the lack of selfies and hair pics lately. I finally had a day where I took some pictures and my hair looks decent. The shine I got is incredible, so that's one good thing. I haven't really enjoyed taking full hair pictures because of this whole thing. Honestly, it is quite traumatizing and I'm pretty damn depressed about it if you want to know the truth. The very ends of my hair are so thing because of the breakage all around. 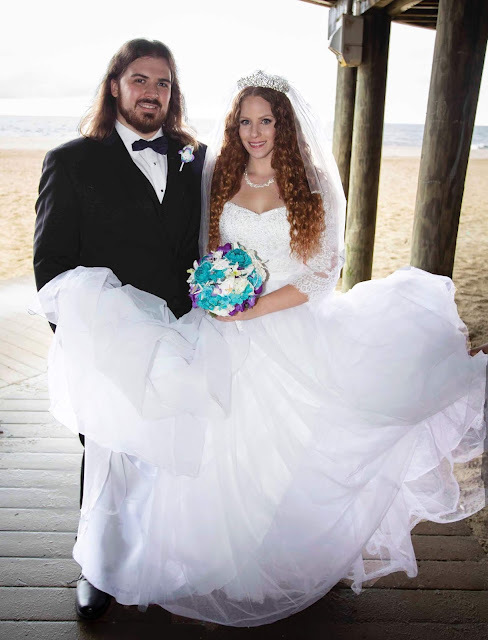 I concealed the bad breakage pretty well in these pictures. Again, TRAUMATIZING. Anyway, a little over a week ago I went to the salon for a color appointment. The past few times I got color they used L'Oreal INOA which is Ammonia free, with oil and supposedly super gentle on the hair. I'm done using bleach on my hair because apparently you can be super careful and obsess over the health of your hair like I did, but that bleach will still mess you up! Hard lesson learned ;( Prior to my color the salon used Olaplex as a treatment. Olaplex is a miracle product. If you haven't heard of it now, google or search the hashtag on instagram and you will see the amazingness. 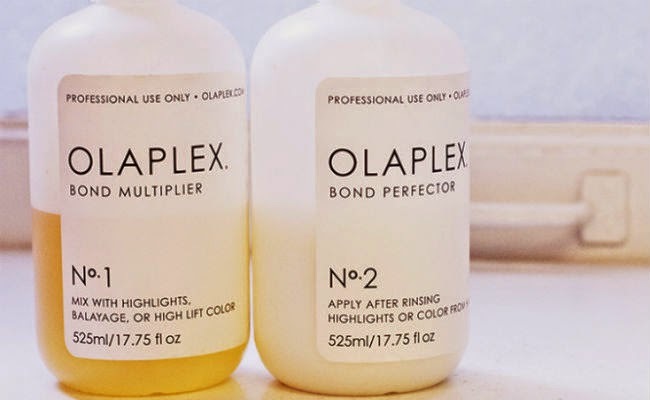 I recently wrote a detailed article about my Olaplex experience for NaturallyCurly that you can read here, as not to repeat myself too much. When at the salon I also (well my stylist) cut about 2-2.5 inches which is the most I had cut in probably 2 years now. My ends were so frizzy, ratty and unbearable I knew it had to be done. At this point, I rather shorter hair that looks healthy than longer hair that looks bad. I am most likely cutting more next time. At least shorter hair seems to be in right now so I am sort of deal while I regrow it back out? I'd also be lying to say I am not considering extensions but for a silly reason, the thoughts of hair extensions weirds me out personally. I know the look so good on other people, but having another person's hair on my head- eehh I don't know! I know, I am being ridiculous. The good news is my stylist said the hair we've been putting just the INOA on and the new growth is really thick and healthy. I also religiously take Viviscal hair supplementa twice a day to help support the healthiest growth possible. I just have to grow out the damaged/bleached parts. 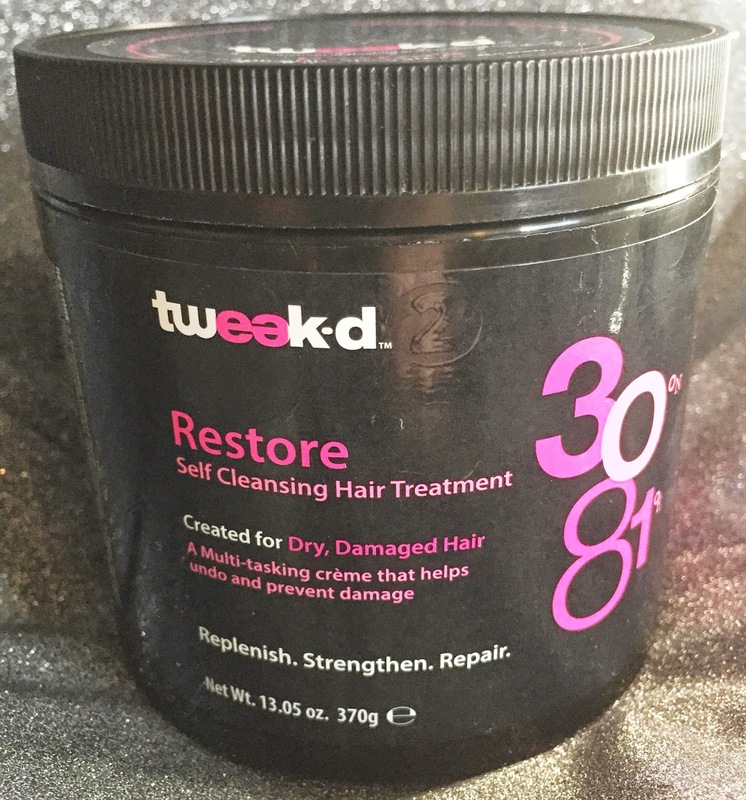 For these pics, which is day 1 hair I used the Tweak-d Self Cleansing Restore Treatment prior to shower. This stuff is seriously so amazing. 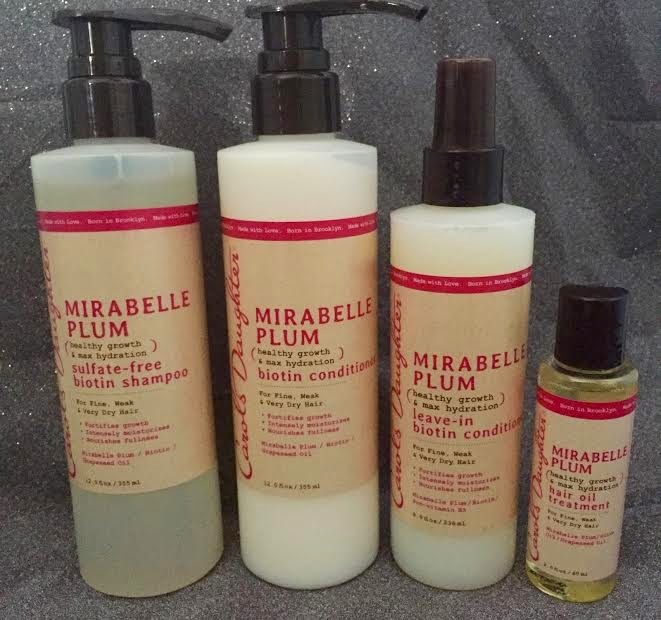 I then used the Carol's Daughter Mirabelle Plum Shampoo. You actually do not need to use a seperate shampoo with the tweak-d but I want the benefits from the Mirabelle Plum line as well. After that I mixed the Carol's Daughter Mirabelle Plum Conditioner with the Olaplex No 3 Take Home Treatment and left it on for about an hour. I applied Shimmer Lights conditioner for the last 5 minutes to help tone. Styling after shower I use quite a few products, but it's working for me for the time being. 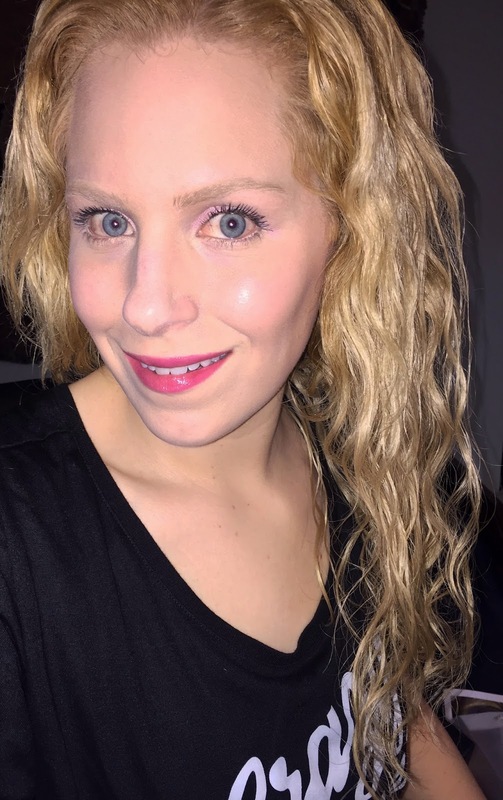 I always apply using the Ouidad Rake & Shake Method and then plopping. I use Kerastase Initialiste on my scalp followed by the Alterna Hair & Scalp lengthing Elixer on both my scalp and hair. These two are to help my growth and breakage. Then I use Ouidad Moisture Lock Leave In Conditioner, Kerastase Ciment Thermique Primer, Living Proof Restore Lotion, Kerastase Discipline Anti Frizz Spray, Ouidad Tress FX gel and seal with SheaMoisture Intense Hydration Oil Serum. I air dried clipping the front sections back to along them. If you want more details on these products check out my recent post about some favorite hair products. 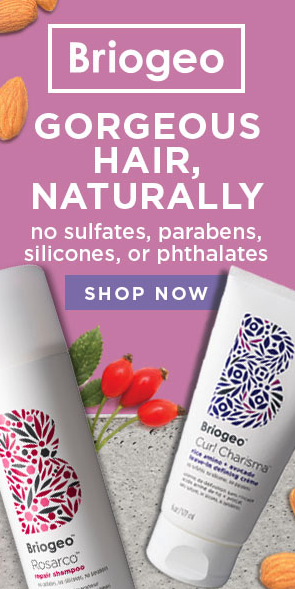 I decided to stop doing the CG method a couple months back when I first noticed the breakage because I began wondering if high porosity, color treated damaged hair is just too naked and unprotected with no silicones at all? I don't know. Hair is a tricky science. It really is all about experience, trial and error and learning what works for you. 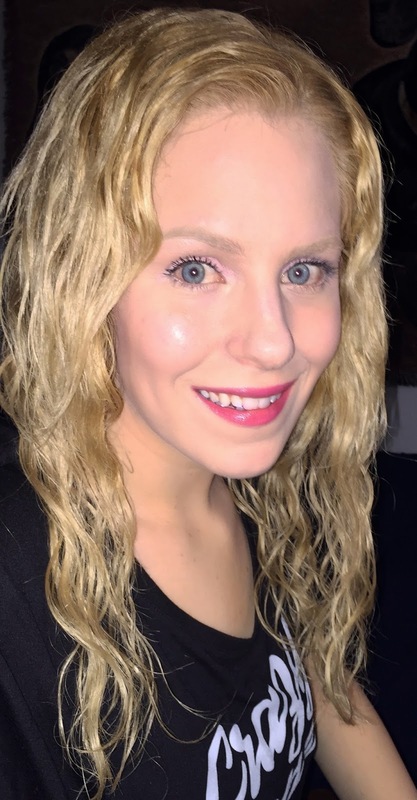 As much as I absolutely love my hair ultra light blonde and will never feel as pretty otherwise, I know it's just impossible for me. I am a human too. I make mistakes and learn from them. Sometimes people I think forget bloggers are not perfect and they humans too. I'd be the first one to admit I am so far from perfect. I did a first impressions here if you missed it. I am so crazy about this stuff! I ordered another one when they were presented on HSN with free shipping last week. It is unique in that you apply it to dry hair before getting in the shower and you don't necessarily need a different shampoo and/or conditioner after! Perfect if you are in a rush. I've been using it every time before getting into the shower, even if I use other products after it. I just how it makes my hair feel so soft and the smell is incredible! This is part of my "hair repair army" as I am affectionately calling all the products I am using to get my hair back into tip top shape. 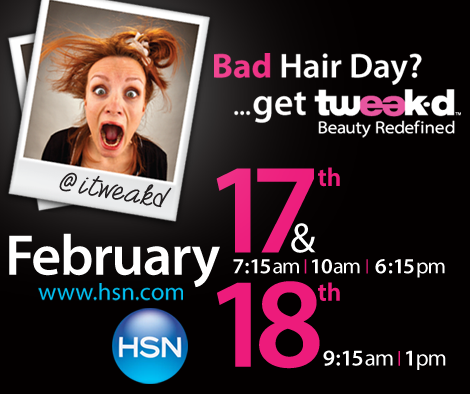 Right now I think the only place in the states you can find it is on HSN. A full review of this will come when I use it all up, but it is so potent that may take a little while. The price of it is a bit outrageous, but it has the largest amount of active ingredients in the highest concentration in one formula and a little goes a long way, so at least it lasts. Truthfully, I have barely been buying makeup and putting that money into quality hair products. The results are immediate- from my first use I saw shine and better manageability. I have been using this for over a month, one time a week while repairing my hair but feel pretty soon I will be able to switch to every other week. If you have problem hair, this may be your solution. 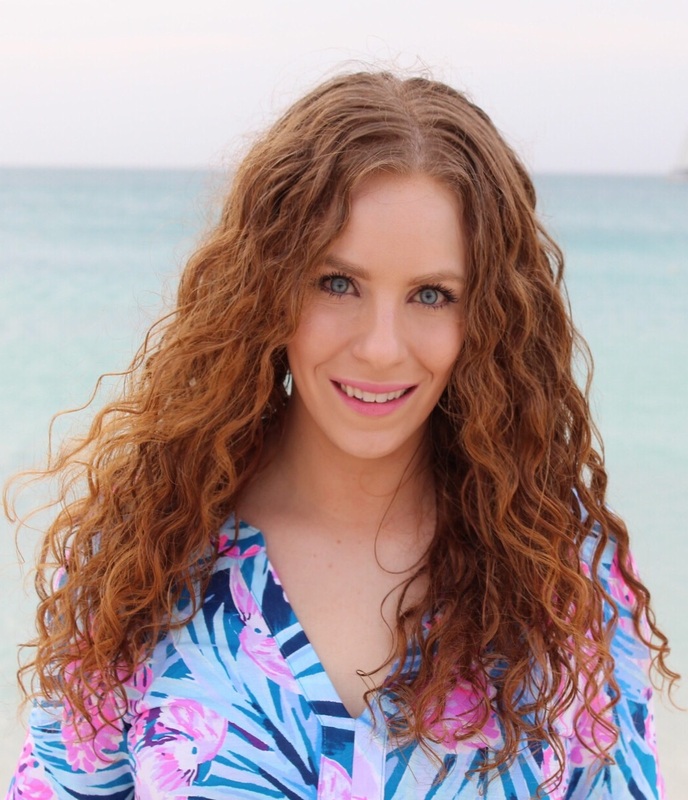 I can't wait for my Olaplex experience article to go on NaturallyCurly.com, I will link it back when it does. I am not exaggerating when I say this stuff is life changing! I get the salon treatment done with my color and then use this once a week to help my hair's strength in between (not the same day as I use the above mentioned Kerastase) This has made my hair not feel like my hair, and I mean that in the best way. If you lighten your hair at all, Olaplex is a MUST. If you take my advice on only one thing ever, I want this to be it. This is a scalp serum I use after I shower. I apply it on the scalp and massage in. It is supposed to help with hair shine, strength, softness and substance. I believe, applying this topically plus taking Viviscal supplements internally, my hair is growing at a nice, healthy rate. This is a hair primer that helps fill in the gaps of the cuticles, strengthens and fortifies the hair fiber and treats weak hair. It works especially well with heat if you are diffusing in the winter. I apply this after my leave in conditioner (I have been rotating a few different ones) but before the rest of my styling products. I alternate this primer with the Living Proof Prime styler extender which is my other favorite primer. This has been a holy grail for years. I adore the whole Living Proof Restore line. They recently redid this formula and I almost freaked out because I loved the old one but i like the new one even better! I use this on wet hair always after my primer and will apply some to day 2 or 3 hair to get the benefits. Leaves hair soft, helps a bit with frizz and split ends. It won't heal split ends because there is no magic that can, but it helps the already split ends you have from getting worse. 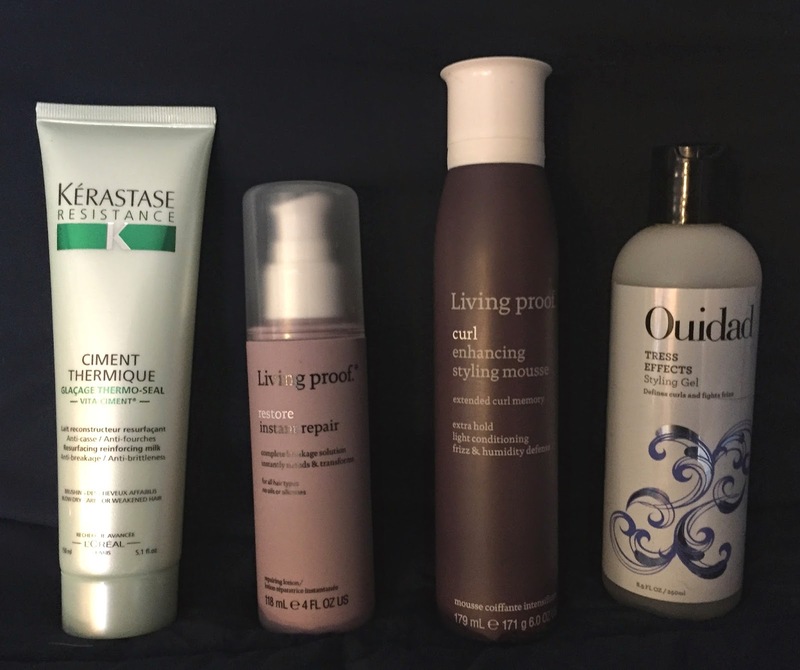 I also have been using the Living Proof Restore shampoo and masque in my rotation. I am also waiting for my full review of this line to go live on NaturallyCurly. I sent it in a few weeks ago so hopefully it will soon and once again, I will link back. I nearly cried tears of happiness when I saw Living Proof come out with a line for curls. The line is nice, but this is my favorite product from it. I never was able to use a mousse before and not need a gel for the additional hold. 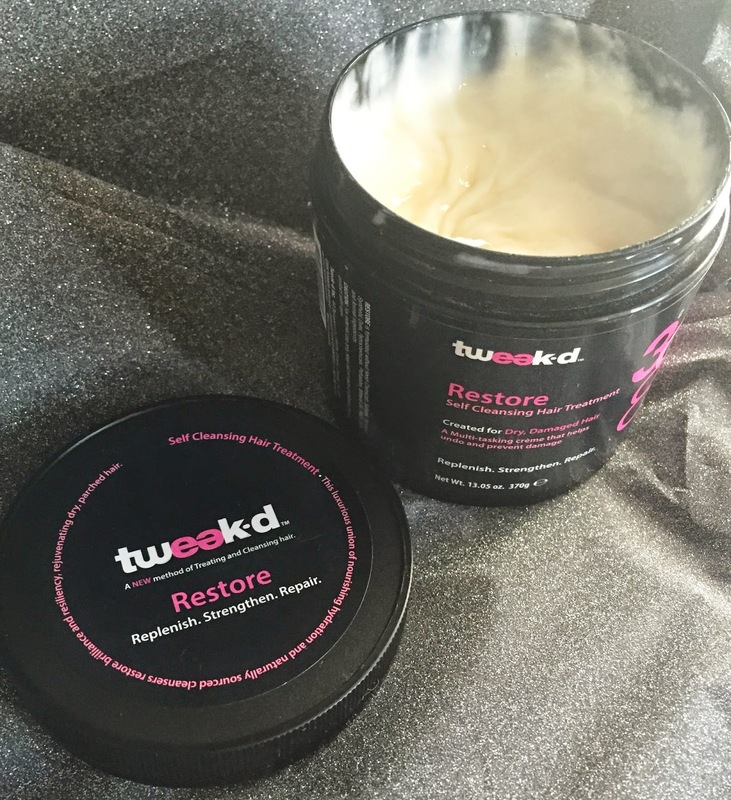 It works great on it's own or sometimes I do layer it under a gel for added curl definition. An oldie but a goodie. I rediscovered this because I am trying to use up my product junkie stash. Ouidad makes such great hair products, I sometimes forget about them because of all the newness that comes around. This gel helps give great definition to my waves with shine and the perfect amount of hold that is not stiff or crunchy. Beneficial ingredients in this gel include amino acids, proteins, vitamin B5 and Clove Oil. Totally off topic but Ouidad just redid their site and I really like all of the information their new site has now. 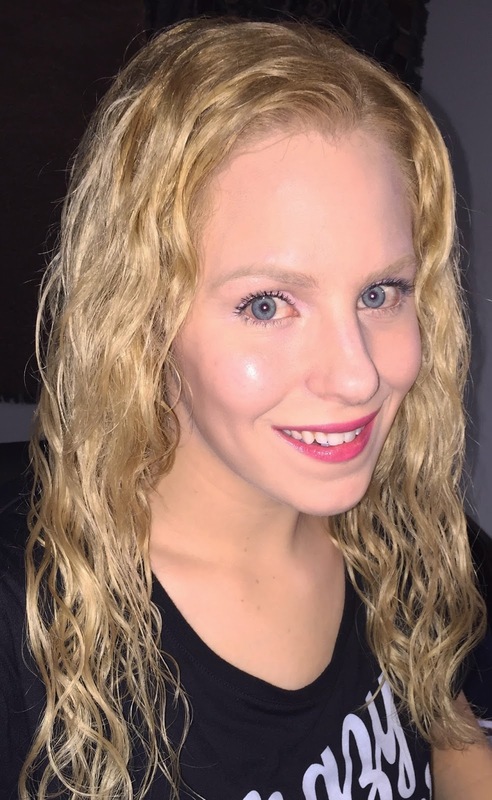 Lots of helpful videos too- I apply all my products out of the shower using their Rake & Shake method and there are videos showing how. Other favorite gels include Devacurl ArcAngel, Original Moxie Hold Up (I need more of this!) and Jessicurl Spiralicious. You can read my whole detailed review on this new Carol's Daughter line HERE. The whole line is amazing, I am incorporating all of the products into my rotation. 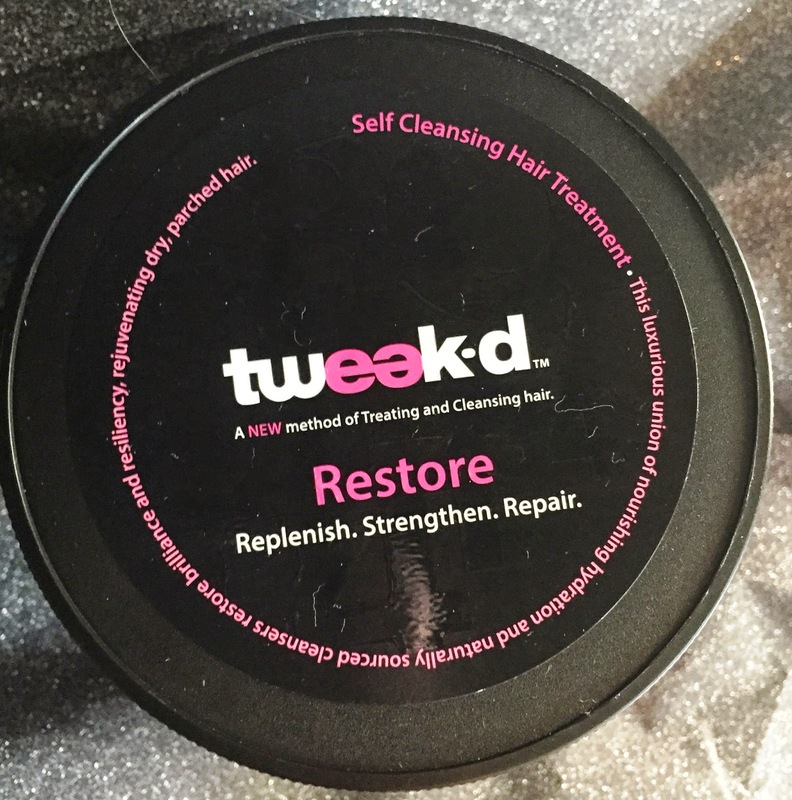 I still can't believe a line came out targeting hydration and hair growth- my two biggest concerns! I am literally reaching reaching for this leave-in spray every single day. It is my current favorite day 2 and day 3 hair refresher, leaving my hair so soft, shiny and just looking better, especially after I first wake up in the morning. Plus I massage some into my scalp too for hair growth. I also have been using the Ojon Revitalizing Mist and Wen Replenishing Treatment Mist sometimes as hair refreshers. This has been my go to oil for sealing my wet hair. It's so very moisturizing but doesn't weigh my hair down! It has African Rock Fig and Baobab Oil and a portion of the purchase (available at Target) goes to charity! You can also use it on your skin and cuticles. Very recently, SheaMoisture did and renamed this line a little bit. I have not tried the new formula yet. This has been a go to milk for my second and third day hair after applying the Carol's Daughter leave-in. It keeps my hair soft and moisturized, which I especially need in this cold winter and I like that there is biotin inside to help my hair growth and stay healthy. Another favorite day 2/day 3 cream for me is the Briogeo Curl Charisma Leave In Creme. Well those are some current favorite hair products. 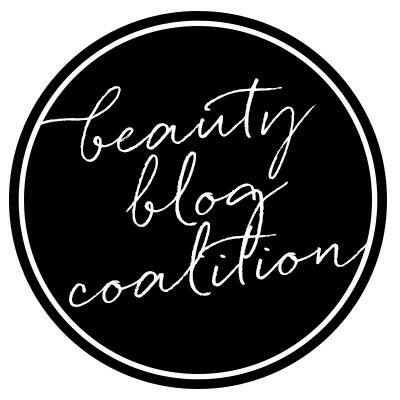 I will try to do blog posts like this a little more often, especially since I am constantly playing with all different products! Monoi Oil is a gift from nature. 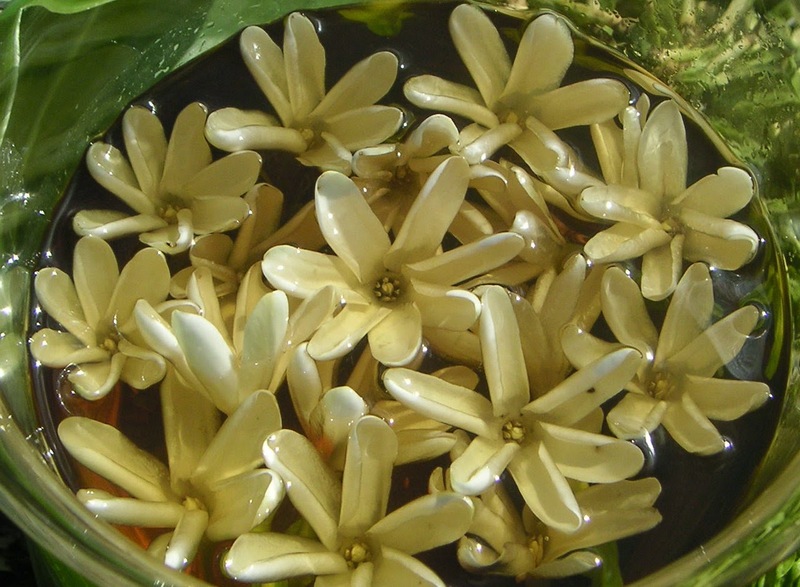 Tahitian for "scented oil", it has been a Polynesian beauty secret for centuries! In fact, Monoi Oil is only produced in Tahiti, French Polynesia. It is highly beneficial for both the skin and the hair containing moisturizing and soothing properties. The scent is very delicate and not overwhelming. 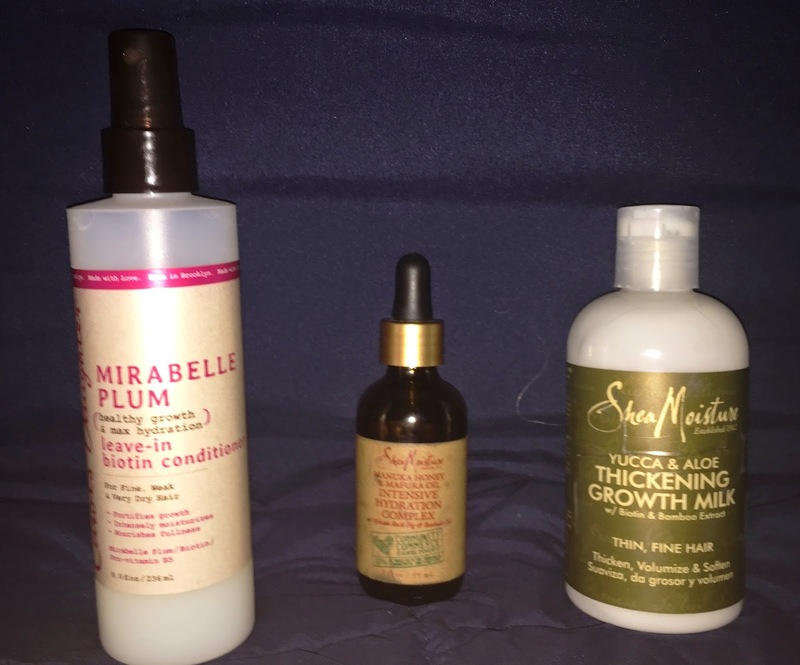 Click here to go to naturallycurly.com to continue reading my article about the benefits Monoi oil has for the hair, skin and some product suggestions! Back in early January, there was a Today's Special Value kit on QVC I had to have! The Dr. Gross Age Defying Solutions 3 piece system is an incredible kit to target a multitude of skin problems and at a great price. The good news is even if you missed the super low TSV price, it is still available on QVC at a considerable savings vs. buying each item separately. I have been eying the skincare in this kit for quite a while now and was really excited to see this configuration put together. Now that I've been using it over a month, I feel I can give a thorough review. With skincare, it is important to use products at least 21 days to see how your skin reacts and behaves, as there could be an adjustment period. It's no secret in the beauty industry Retinol is the best ingredient you can use on your skin to combat some of my above mentioned issues. It's always important to use sunscreen, but especially important if you are using Retinol, as it makes the skin more sensitive to the sun. 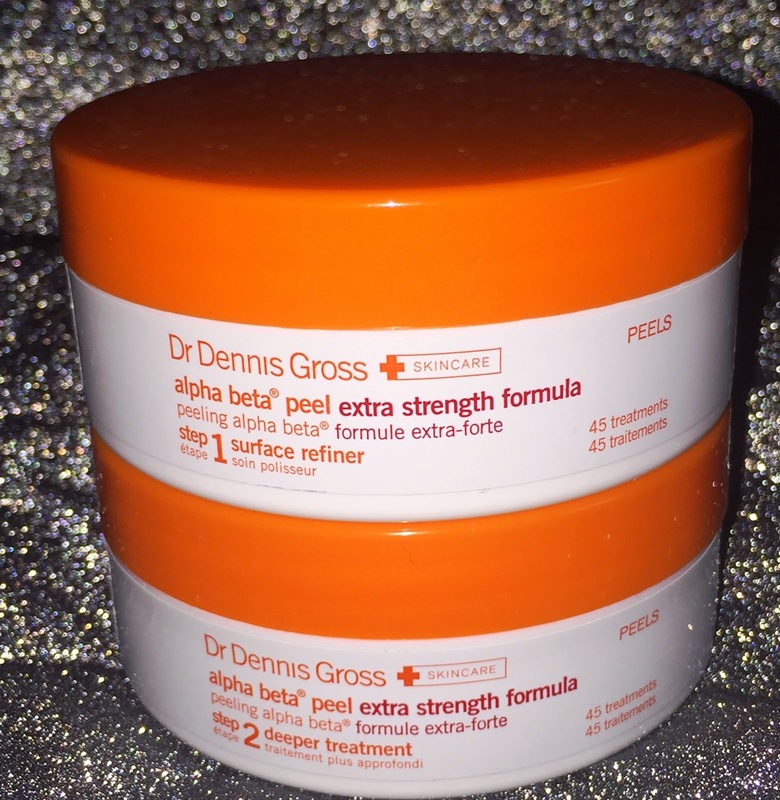 "Why is it different: The Alpha Beta Peel helps to improve cell turnover, smooth skin, and improve texture, leading to a brighter, healthier-looking appearance. The brightening solution and moisturizer with Ferulic Acid + Retinol help to reduce the appearance of fine lines and wrinkles, while helping skin appear firmer and younger-looking." What I say: These are easy to use and the pads are use. I actually cut them in half to get 90 days out of the jars as opposed to 45 and still have enough for my face, neck, chest and hands! I use them every night or every other night and I apply step 1, wait 2 minutes (good time to brush my teeth) and then apply step 2. 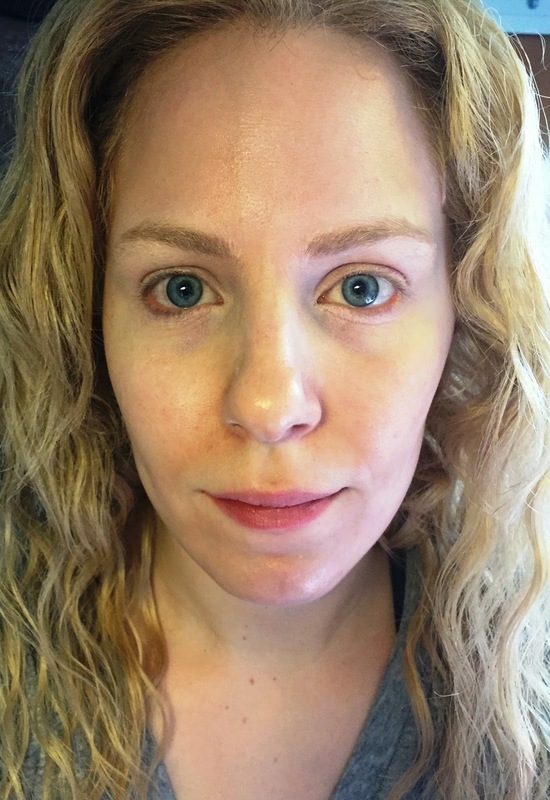 I know it sounds crazy, but my skin looked better after 2 nights! It looked more radiant, clear and even toned. I forgot how much I adore these and don't ever want to be without them again.Out of the whole kit, they are my favorite. What I Say: I was really excited to try this, as I have a close friend obsessed with this stuff. Right now I am only using it at night and I use the Dr. Gross Clinical Concentrate Purifying Booster in the morning, but I want to see if it is safe to mix them so I can get the benefits twice a day. It is lightweight, almost like water and sinks into my skin instantly. I like knowing this is helping to fight previous sun damage! What I say: This stuff is very potent, I need the teeniest, tiniest amount. I am using it twice a day and following up with sunscreen in the morning. With this dry winter, it isn't too heavy for my combination skin at the moment but I do have concerns come Summer time, it may be a bit too much for me. It glides onto my skin like butter and leaves me feeling nice and hydrated. 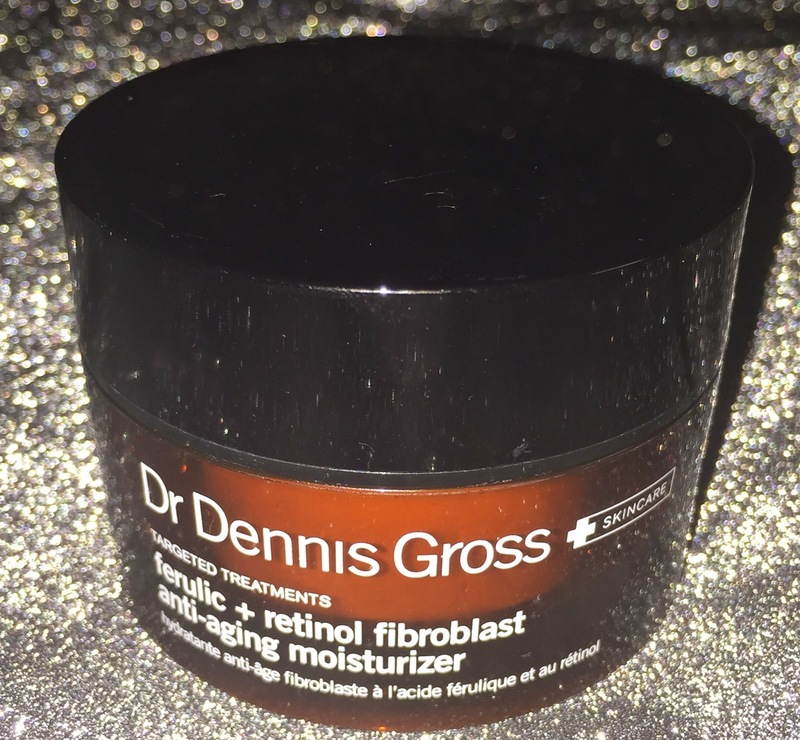 If you do have dry, mature skin I think you would fall in love with this moisturizer. When I use the products at night, after cleansing my face with my Clarisonic and a cleanser, I use the pads, then the serum and then the moisturizer followed with an eye cream. Overall, I really like the Dr. 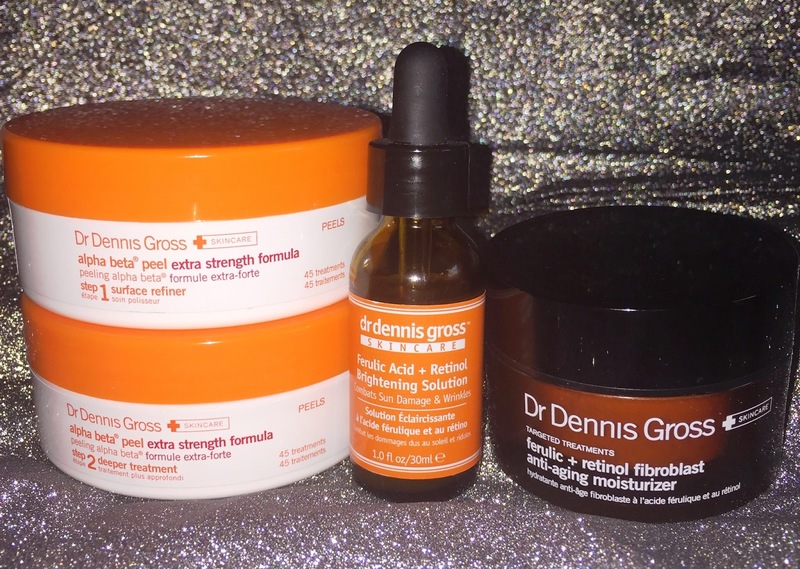 Gross skincare products. I just am just beginning to notice some fine lines and am hoping by using good anti-aging skincare products, I will stop them before they turn into deep wrinkles. So for me, using these products are also about being preventative, it is never too early to do so! As mentioned, I have only been using them about a month so I look forward to great results with continued use. I signed up for the auto delivery option which means the kit will be delivered to me every few moths at the Today's Special Value price. disclaimer: products bought by me. All thoughts and opinions are my own, honest views, as always. I adore the beautiful hot pink and orange box for February! It is so bright and warm- something we absolutely need since the weather outside has been absurdly cold lately. 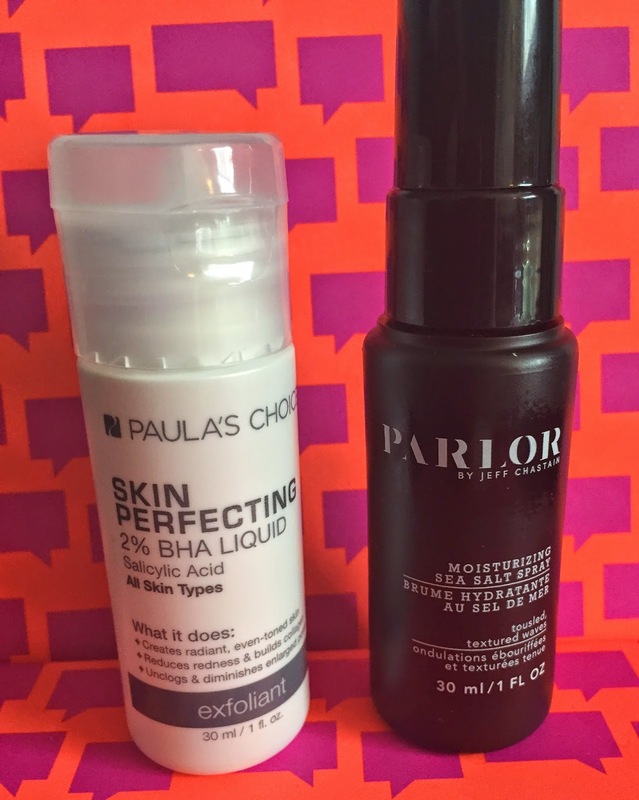 I am EXTREMELY happy with the goodies in my Birchbox this month! The theme this month is "friendship" and I was able to select one item prior. Between my curiosity and hair product junkie ism, I went with a "mystery brand" hair moisturizing sea salt spray. 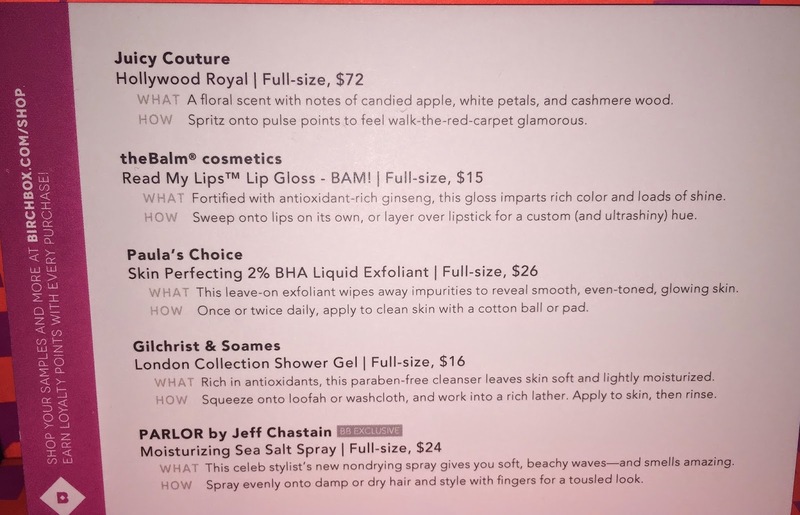 ...The mystery brand is PARLOR by Jeff Chastain and it is a Birchbox exclusive brand. What is interesting about this product is unlike most sea salt sprays, it actually moisturizes! The product made a lovely day 2 hair refresher for me bringing my waves back to life, adding some softness and definition. Like the insert card states (see pic below) it also smells amazing. I can't pinpoint the smell exactly but it is sort of a warm sweet floral to me. ...I haven't had a chance to try this out yet but it sounds amazing. It is a leave on exfoliant that is supposed to wipe away inpurities to reveal smooth, even-toned glowing skin. I like the fact it contains Salicylic Avid since I am still breaking out like a teenager (thanks, stress) If you want a full review on this, let me know. ...This shower gel is so yummy. I smell almonds and praline inside. It's sweet, but not overly sweet. I only washed my hands with it because I like these small sizes for travel but my hands felt clean, soft and nourished! This shower gel is also rich in antioxidants and paraben free! ...I usually loathe perfume samples, but since working with fragrances I have a new appreciation for them. I have smelled this perfume last month and I really like it! Notes include Candied Apple, Juicy Pear, Jasmine, Gardenia, Marshmallow and Vanilla. The irony is I usually can't stand Jasmine or Gardenia, but I LOVE Vanilla and Marshmallow- so the balance works out. It's a very nice fruity floral that doesn't overwhelm me. 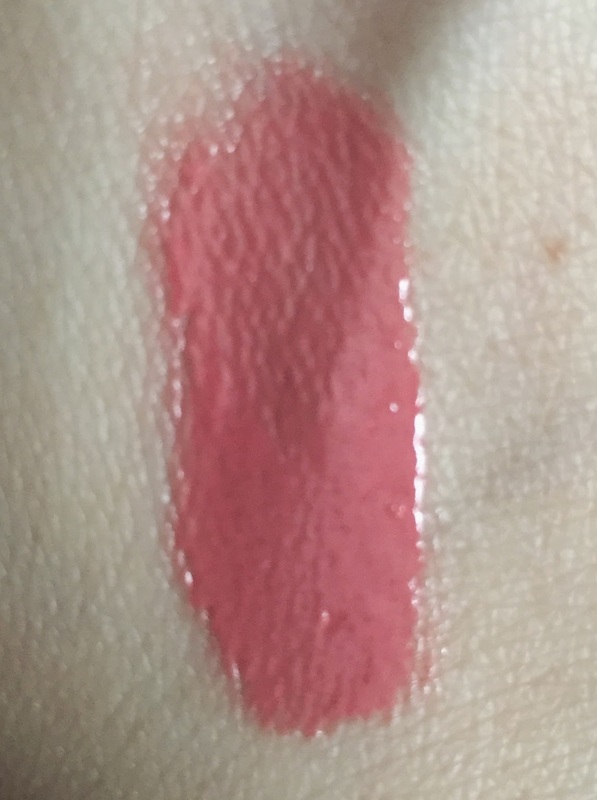 ...I am a lip product junkie and lately I have been buying a significant less amount of makeup. Getting lippies in my Birchbox helps my fix while allowing me to stick to me budget. 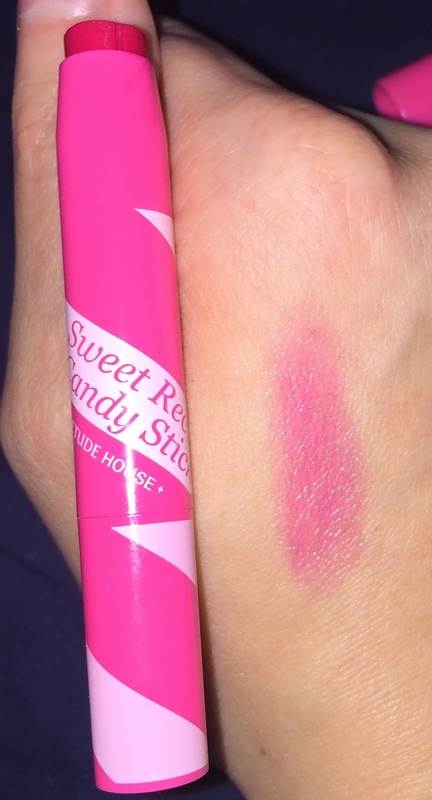 I love everything about this gloss!!! The comic book lover in me is crazy about the adorable packaging. The color is pigmented with the perfect amount of shine. It is a nice lighter peachy-pink color. 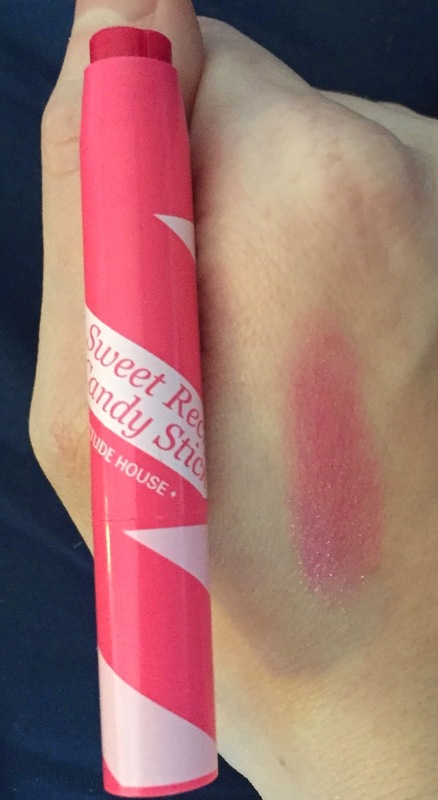 The gloss is a tiny bit sticky, but I feel this stickiness helps it stay on longer. It also has antioxidant rich ginseng to help the condition of the pout and smells like melons. 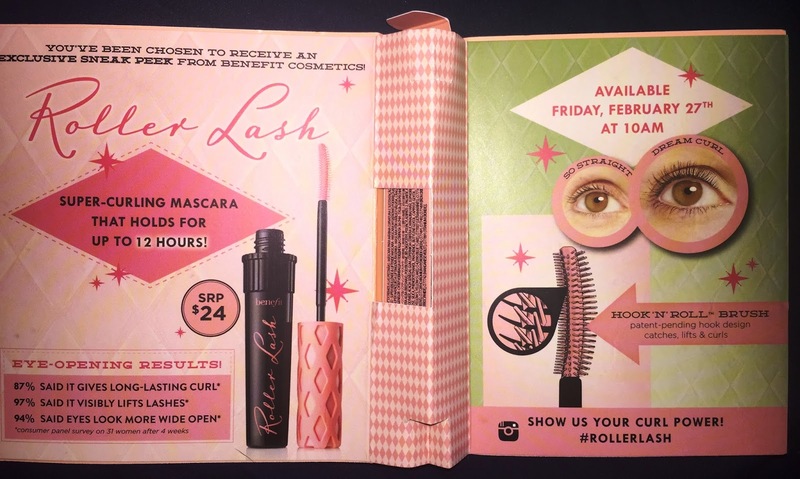 So also in my Birchbox was an advertisement for Benefit's new Roller Lash mascara. No sample though. 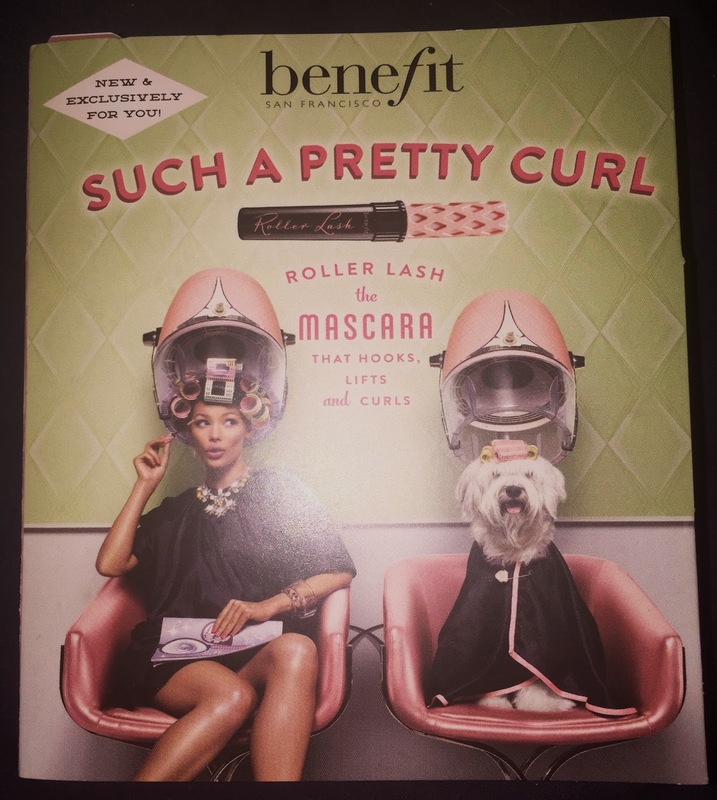 =( I would love to get this in a future box because the packaging is adorable- so retro & the cap is a curler!! Plus I love trying new mascaras. 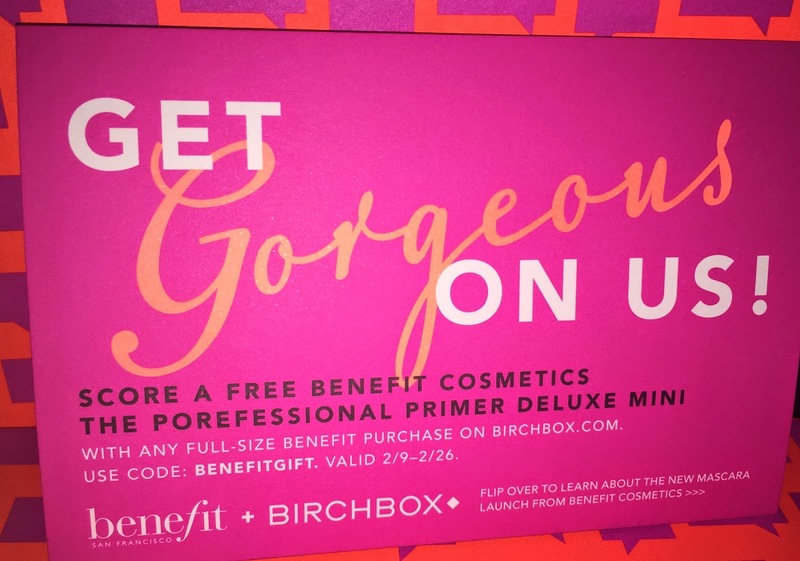 They did however provide a code for a free Benefit primer mini with purchase from the Birchbox shop. I don't know why the code wasn't for a free mascara mini? I don't know, I thought that was odd. 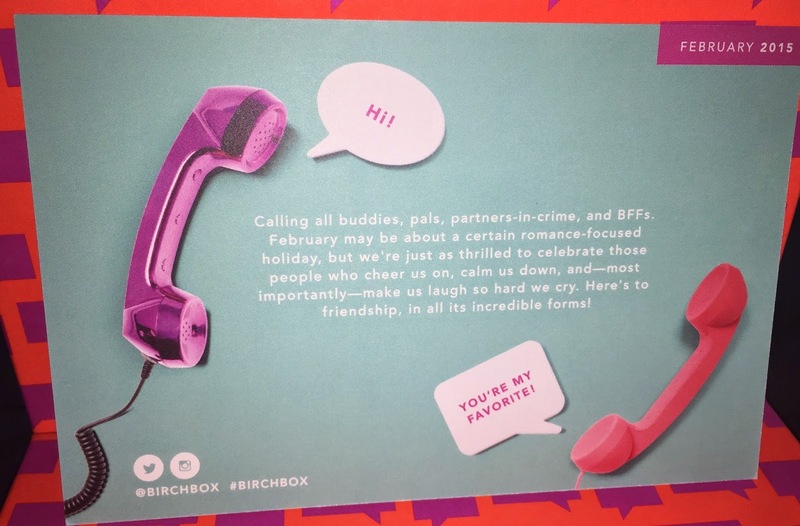 So, fragrance sample and all my February Birchbox was a winner for me! You can't beat this for ten bucks!! The Birchbox rewards program in a nutshell: when you do reviews of the products they send, you get 10 points. 100 points = $10 in the Birchbox shop which is fully redeemable for full size products! Birchbox also runs sales and extra points offers so if you are a coupon queen like moi, you wait until a promo is going in to cash in your saved up points and have a lovely guilt free haul. Also, any purchase in the Birchbox online shop or SOHO store gives you points as well. 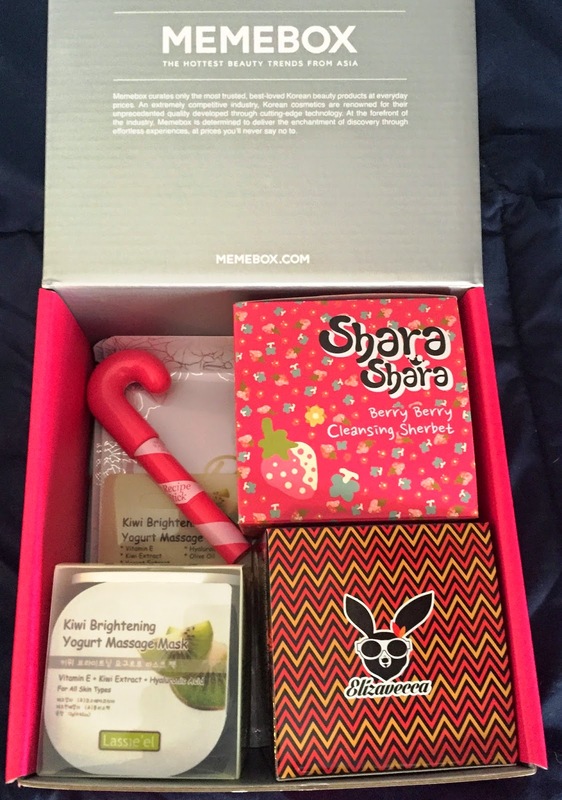 If you'd like to sign up for Birchbox, click here!